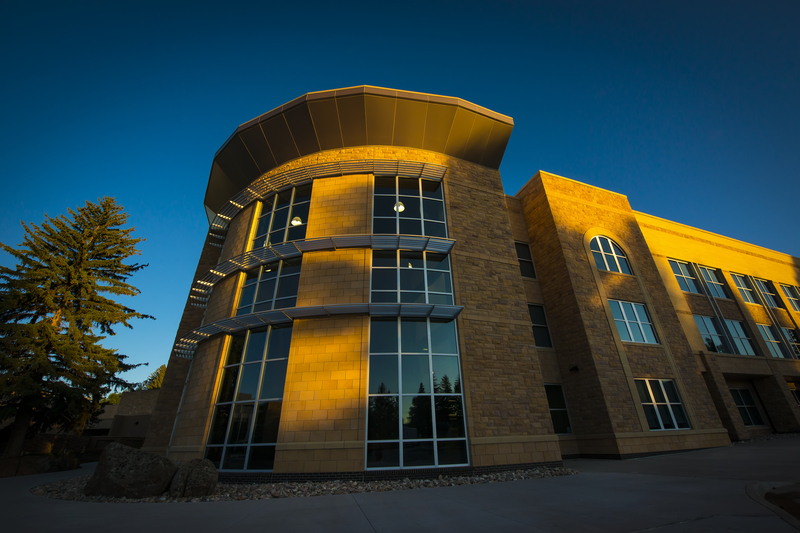 The University of Wyoming’s Laramie campus continues its growth with two newly renovated and expanded buildings: The Buchanan Center for the Performing Arts and Half Acre Recreation and Wellness Center both bring University of Wyoming (UW) students, staff and visitors form and function with an eye on sustainability and high performance. To achieve these objectives for each facility, B&W Glass installed Wausau Window and Wall Systems’ high-performance SuperWall™ curtainwall and ClearStory™ sun shades. The $35 million renovated and expanded Buchanan Center for the Performing Arts presents a sleek, modern design imagined by Tobin & Associates of Cheyenne, Wyoming, in collaboration with Minneapolis-based HGA Architects and Engineers. The center broke ground in May 2013 and was completed in May 2015. The facility is designed to meet LEED® Silver certification criteria for energy efficiency and environmental practices, and varying acoustic requirements for each room. Named for UW’s recently retired president, Tom Buchanan, the Performing Arts Center includes approximately 50,000 square feet of new construction. It also involves partial renovation of the existing 129,000-square-foot Fine Arts Center, which houses cultural programs and fine arts outreach, as well as the music, theater and dance departments. The glass and aluminum façade relies on a unique, double wall provided by Wausau to meet both the high acoustic performance and a free span of more than 31 feet. 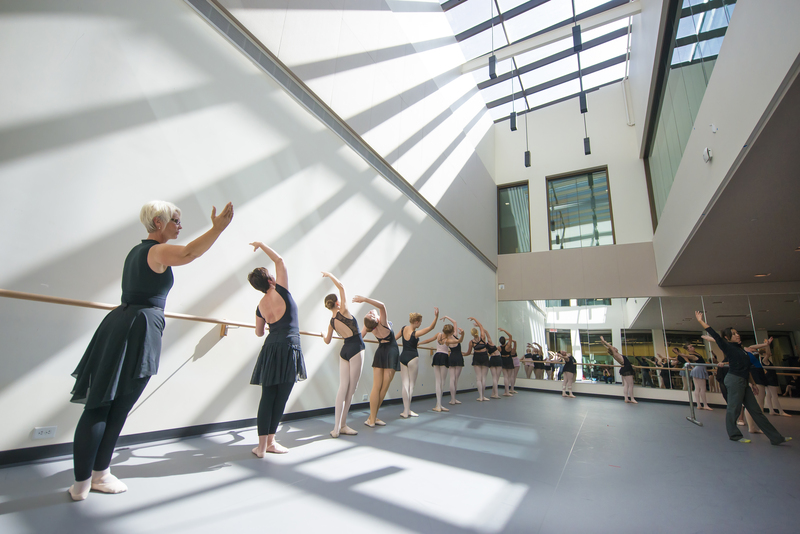 Throughout the facility, five different acoustical specifications were applied depending on application in the faculty studios, the corridors, the choral rehearsal rooms and the dance studio. For UW’s Buchanan Center, the curtainwall system’s aluminum framing was finished by Linetec in a medium bronze anodize finish. Anodized aluminum is 100 percent recyclable, and provides excellent wear and abrasion-resistance with minimal maintenance in most environments. Furthering the project’s green building goals, Dwyer stated, “The original building was constructed in the 1960s and, as such, thermal performance wasn’t ideal.” Improving this where they could, HGA specified Viracon’s VNE 1-63 glass with Solarscreen™ reflective coatings to maximize energy efficiency and comfort. The Performing Arts Center also includes: the new 256-seat Thrust Theatre and 100-seat Recital Hall; studios for bands, vocal music, jazz, piano, dance, performance, lighting and sound, theatre design and recording; conference and seminar rooms; dressing rooms; green rooms; the box office; practice rooms; offices; offices and studios, and office support. Tobin & Associates and Denver-based Ohlson Lavoie Collaborative (OL) worked in tandem to expand and remodel the historic UW facility formerly known as Half Acre Gym. The $27 million two-phase project allowed students to continue to use portions of the facility throughout its renovation and expansion. 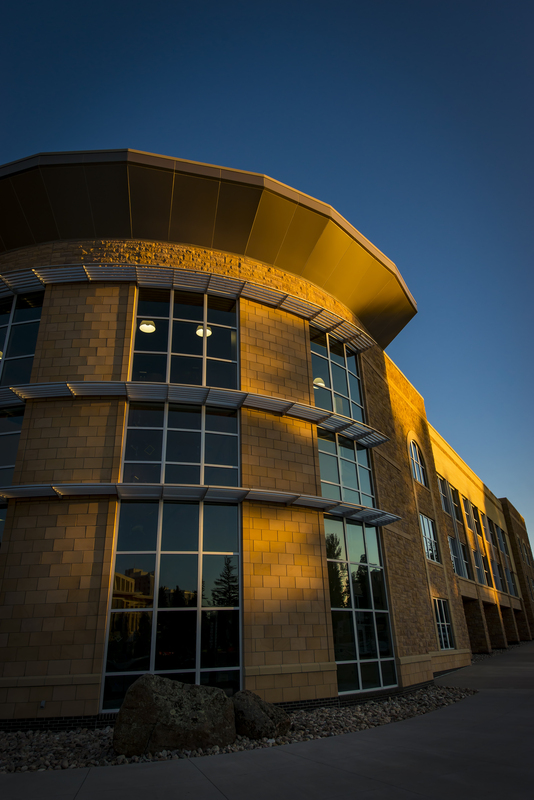 Phase I of the project, completed in January 2015, reopened the new 101,000-square-foot east portion of the building as the Half Acre Recreation and Wellness Center. Phase II remodeled 40,500 square feet of existing space on the historic west portion of the building and reopened in Spring 2015. 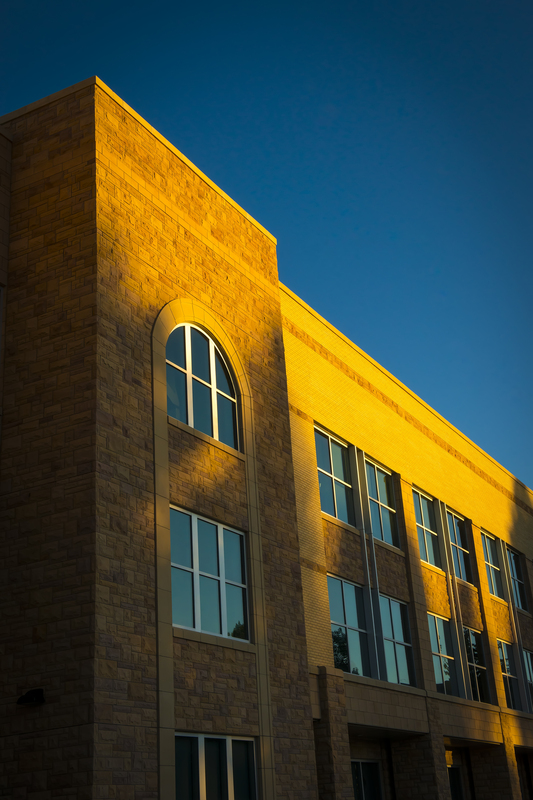 The generous use of Wausau’s SuperWall throughout the Half Acre Recreation and Wellness Center demonstrates the importance of natural light in the building’s design. The gym’s east side boasts a three-story curtainwall, offering visitors and passers-by views of the new climbing wall and other interior spaces. Along with the curtainwall, B&W Glass installed Wausau’s pre-engineered, 36-inch-deep ClearStory exterior sun shades in a five-blade design following the radius of the building. These aluminum sun shades optimize energy performance and thermal comfort by controlling solar heat gain, managing visible light transmittance and maximizing natural daylighting, all while preserving outside views. Linetec finished the sun shades in Champagne anodize to complement the building’s light-colored facade. The renovated facility now includes dedicated academic spaces for the kinesiology/health and theater/dance departments. The facility also features a new entrance and lounge area, new racquetball courts, an expanded outdoor program space, a climbing wall and expanded fitness spaces.